Tom de Kok is a Canadian physician who serves as Médecins Sans Frontières co-ordinator for Search and Rescue in the Central Mediterranean. At the end of last summer, I arrived on board the Aquarius, a search-and-rescue ship run by Doctors Without Borders/Médecins Sans Frontières (MSF), in partnership with the charity SOS Méditerranée. I went there to co-ordinate MSF’s efforts to save people at risk of drowning in the Mediterranean Sea while they attempt the dangerous maritime crossing between Libya and Europe. 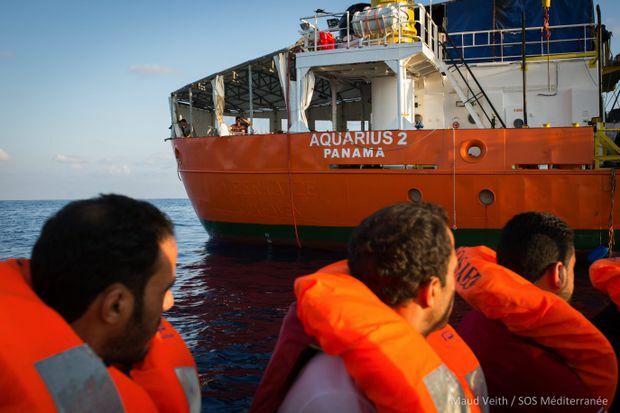 Today, however, the Aquarius is no longer carrying out search-and-rescue operations. Our humanitarian work has been deliberately blocked by hostile governments, and my fellow rescue workers and I have had to leave the ship for good. The stoppage’s impact on human lives will be severe. Between 2016 and last fall, nearly 30,000 people were pulled alive from the Mediterranean onto the Aquarius’s deck. Over the few months I was on the ship, I met some of them and heard their stories. The testimony of one woman, who had disembarked from the Aquarius to safely submit her asylum claim just before I arrived, has been burned into my brain. After two years in Libya – where she was held in detention at the hands of authorities and trafficking rings – and after four foiled attempts to reach Europe by sea, she tried the crossing one last time, and ended up being rescued by the Aquarius. She told us the horrible stories of what had happened to her since leaving her home: of how she had been gang-raped and sold into prostitution, and how she had watched her sister die. Her mother had been extorted for protection money via phone many times. She finished by saying there was so much more to tell, but that she just didn’t want to remember any more. The Aquarius, a search-and-rescue ship run by Doctors Without Borders/Médecins Sans Frontières (MSF), in partnership with the charity SOS Méditerranée, arrives at Marseille port, southern France, on Oct. 4, 2018. Not all rescued people’s stories were as harrowing, but all were seeking safety for themselves or their children. Many of them had only recently escaped horrific conditions inside Libya’s detention centres for migrants. We also rescued Libyan families who were fleeing violent clashes that had erupted in the Libyan capital of Tripoli. Despite having been crammed into flimsy vessels and set adrift on the Mediterranean Sea, the people I met were the lucky ones. Thousands of other children, women and men attempting the same journey in recent years have drowned or are still trapped in a cycle of suffering in Libya. Statistically, four people a day die on the Mediterranean. They die of drowning or of exposure, and, ultimately thirst. Those who survive are often returned to detention in Libya, where they face dangerous and sometimes lethal conditions, without recourse to an appeal. And yet, on Dec. 7, MSF announced that the Aquarius will no longer carry out search-and-rescue operations. Why are MSF and our partners unable to continue saving lives in the drowning grounds of the Mediterranean Sea, despite continuing humanitarian suffering and death? Put simply: because European politicians have forced the Aquarius and other rescue ships off the water. A variety of methods have been used to attack and block humanitarian search and rescue: Twice this year, the Aquarius’s flag was revoked, first by Gibraltar and then Panama, rendering our vessel legally and administratively paralyzed. This happened for no reason other than politics. Gibraltar removed its flag several days after the Italians asked Britain to accept 141 rescued people on board the Aquarius, while Panama revealed it was under threat of economic repercussions from the Italian government. Then, Italy froze MSF’s bank accounts, charging us with profiteering from waste management and suggesting we might spread HIV or TB via clothing. Other NGO boats have been impounded, and MSF and other organizations have been wrongly accused of acting as human traffickers for refusing to return rescued people to Libya. Ships of all kinds who try to rescue people in distress at sea have been threatened with legal action. We may call it the politics of deliberate indifference, but that is far too polite: It is something much worse. The justification given for these actions is the need to stop “illegal” migration. But in acting this way, European governments are themselves violating international law. For almost 70 years, returning people to a place of danger or persecution has been prohibited under international conventions. Maritime laws require vessels at sea to rescue nearby ships in distress. Ask my old lobster-boat boss in Advocate Harbour, N.S. – in fact, ask any mariner: Responding to distress is a sea captain’s Hippocratic Oath. And yet, it is this oath and these laws that Italy and other governments are deliberately undermining. 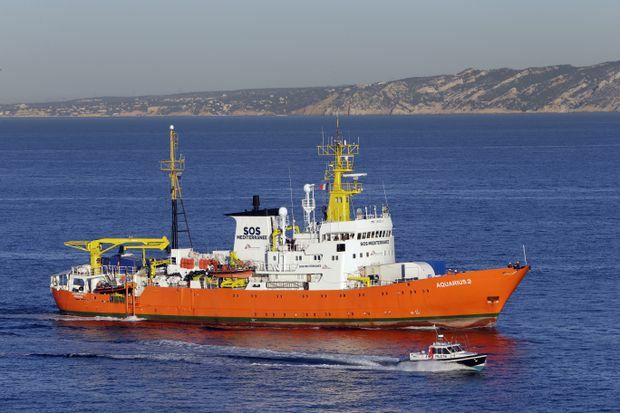 SOS Méditerranée calls for protests and a Europe-wide mobilization to help them regain a flag to resume their rescue operations, in Marseille, France, on Oct. 6, 2018. In 2012, Italy was found guilty of infringing the human rights of 24 Somalis and Eritreans aboard the Hirsi Jamaa by sending them back to Libya, where they were in danger – a process known as refoulement. Late last month, the Office of the United Nations High Commissioner for Human Rights and the UN’s Libya mission issued a harrowing report documenting the “unimaginable horrors” migrants and refugees are subjected to in Libya. The report, along with a recently rereleased UNHCR position paper clearly demonstrate that returning people to Libya who attempt to flee across the Mediterranean is still against the law, as it was in 2012. But Italy has sought ways to do so anyway. In May, the Italian government and the European Union installed the technical requirements for Libya to have its own rescue coordination centre endorsed by the International Maritime Organization. This has allowed the act of returning rescued asylum seekers to Libya to be masked as “capacity building” and “state responsibility,” instead of the violation of international law that it so clearly is. The Libyan coastguard has forcibly returned 15,000 back to Libya this year alone, all with the help of EU funding. It is de facto refoulement. Laws are being trampled on in favour of short-term political interests. By July, rescue ships such as ours in the Mediterranean were being forced to make a choice every time we assisted a migrant vessel in distress. We could continue to follow maritime law and bring the people we rescued to a place of safety – but with countries such as Italy refusing to allow us to disembark, we then risked being adrift at sea with large numbers of vulnerable people on our decks. Or, we could violate the law and do as Libyan authorities were ordering us to do, which was to bring all those we rescued back to detention and abuse in Libya, where they are clearly in danger. Sending anyone rescued at sea back to arbitrary indefinite imprisonment, where their physical and mental health will be eroded, is neither a legal nor an ethical option. For merchant vessels, the situation is more complicated, because their mandate is not primarily to save lives, and the risks of violating orders from local coast guards are higher than the risk of violating international maritime laws. The global community, which should be upholding those laws, is turning a blind eye. Quietly, without much noise, the sacred practice of rescue at sea is itself sinking. I don't know who deserves asylum and who doesn’t. But I do know that every one of the people we rescued with the Aquarius deserves a fair hearing. More than that, I refuse to believe anybody so desperate deserves to drown. Medical treatment and humanitarian assistance for vulnerable people is basic. Suggesting otherwise is unacceptable for a doctor. Saving lives is not a crime, and those who are saved have a right to their life. That we live in times where this needs saying is sad. I began my career with MSF years ago in Pakistan, and went on to do many other postings in places such as Darfur and Democratic Republic of Congo. I saw the world applauding MSF for saving lives and bearing witness to people’s distress in tough places. Where are these voices of support now that the people we are helping are migrants? Is it too close to home? Is the fear-mongering of a migration crisis that now represents one arrival for every 6,750 or so Europeans really so convincing? Migrants being rescued by the Aquarius following negotiations with Libyan coast guards in the search and rescue zone off the coast of Libya, in the Mediterranean Sea, on Sept. 23, 2018. Wherever I practice medicine in Canada, whether in a small Fredericton clinic or a big Toronto emergency room, we don’t debate about whether or not someone deserves saving. That is absurd. The situation should be no different on the Mediterranean Sea. Human rights don’t stop at borders; neither do international laws. When someone is desperate enough to attempt to cross the world’s deadliest migration route, it usually means something is very wrong. Imagine a fear big enough to drive you to leave everything you know to get into some crook’s little rickety boat to cross the Mediterranean – to risk not only your own life, but the lives of your children. Imagine preparing for a journey by taking contraceptives in the knowledge that you may well be sexually assaulted. The politics of deliberate indifference – from outright thuggery to kowtowing and duplicity – is currently killing people, and condemning them to crimeless incarceration. This isn’t the kind of politics that produced the Universal Declaration of Human Rights, the Canadian Charter of Rights or the Canada Health Act. It is not the ethos of a Canadian ER or a little clinic in New Brunswick. It is not how fishermen in the Maritimes work. When encountering people in distress, the responsibility of a boat is to save them and take them to a port where their safety is guaranteed. This is the law. As Western governments become increasingly guided by what is politically acceptable rather than by what they are responsible for, they are drowning the rule of law – and alongside it, the principles and values upon which our societies were founded. Fleeing your home is not a crime, it is a human right. Criminalizing a person’s flight at the same time as criminalizing those who seek to save them is tragic. Allowing this dehumanizing rhetoric to go unchallenged is a threat to all of us.